We have visited Greensboro, North Carolina a number of times and when we have to leave it’s “Gee we really like this city”. Expect a great time in Greensboro, NC. Greensboro, more than anything is a fun city. Start with the name, easy enough, Green after Nathanael Greene a Revolutionary War hero who actually lost the historic battle at Guilford Courthouse but inflicted so much damage on the British army it caused British commander General Cornwallis to exclaim “Another such victory and we shall lose the war”. 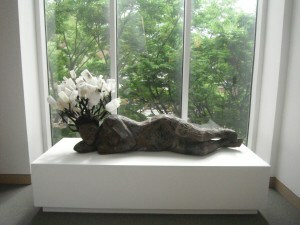 Take time to visit the Weatherspoon Museum of Art in Greensboro. 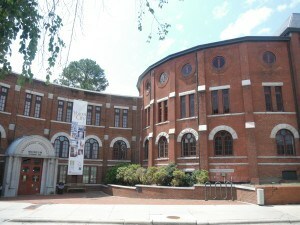 the Weatherspoon Museum of Art on the North Carolina -Greensboro campus, one of six colleges in the area as well as the African American Art Atelier, a plethora of restaurants, sports venues such as First National Bank Field, home to the Greensboro Grasshoppers baseball team and their amazing bat dog. 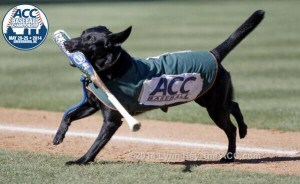 The Greensboro Grasshoppers Bat Dog! Visit the National Civil Rights Museum, the Greensboro Historical Society, and Museum. The fascinating Greensboro Historical Society and Museum. 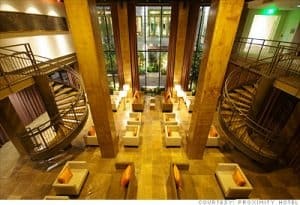 On our trips to this entertaining city, we’ll alternate our stays with the sister hotels, (totally dissimilar except for exemplary service, dining, and facilities in every way), the modern award-winning “green” Proximity and the elegant historic O.Henry Hotel. These two hotels are enough of a reason to come to Greensboro. You’ll find an ever-changing choice of unique events such as the upcoming extraordinary “Premier Cru” Wine Dinner at the Proximity Hotel featuring six amazing wines and a superb five-course dinner. You’ll also be boosting your wine knowledge with America’s top expert on Maison Louis Jadot Burgundy wines and Taittinger Champagne, with Antoine Collet pouring Single Vineyard, Premier Cru wines paired with Chef Leigh Hesling’s extraordinary menu. Take an easy ride home via the elevator to your elegantly modern room with fittings you’ll dream of owning. In the morning return to the Print Works Bistro for breakfast. 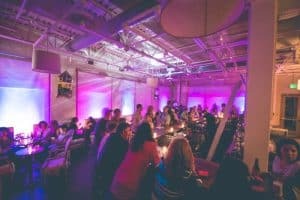 Everyone has a great time at the Print Works Bistro Bar in Greensboro. In our experience, the Print Works Bistro also has a very lively and well attended “Happy Hour”. The bar area was always packed with lots of “Happy” Greensboro and traveling people. Sister hotel, The O.Henry is a change of pace with its classically beautiful rooms and public spaces reminding me of our stays in England and great garden spaces. The first time we had a lunch and then a private evening reception in the terrace and Social Lobby, not even the young women could compete with the beauty of these rooms. True class!Jazz in the Social Lobby at the Historic O.Henry Hotel in Greensboro. There is so much going on you’ll want to come out of your room for craft cocktails and tapas-style good eats each Thursday and some Saturday’s for O.Henry’s Jazz in the Social Lobby. Executive Chef for the Proximity and the O.Henry Leigh Hesling believes in utilizing seasonal ingredients with appropriate and delicious changes to menus at both the hotels. 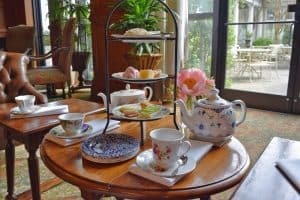 All ages will enjoy the elegant afternoon tea at the O.Henry in Greensboro. Then for all ages, taking tea in O.Henry’s Social Lobby has become a Greensboro tradition. It’s so popular the hours have been expanded. Check their website for updates and to see the unique themed teas available. 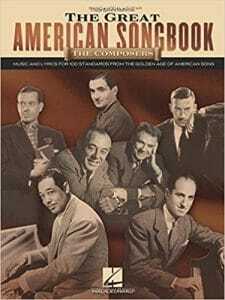 The Great American Songbook an incredible resource for all.. 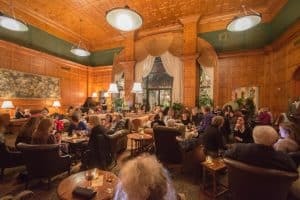 The O.Henry Hotel is a great setting for jazz, cocktails and tapas-style good eats. That’s what you’ll find at Cocktails & Jazz Series each Thursday (from 5:30–8:30 PM). Each week the O.Henry Trio with artists Dave Fox (piano), Neill Clegg (sax, clarinet, and flute) and Matt Kendrick (on bass) are joined by a group of extraordinary guest vocalists who cover The Great American Songbook and other jazz classics. For our O.Henry Jazz Series, on select Saturdays (from 6:30–9:30 PM), we host an eclectic array of local artists performing a variety of jazz genres. Lots of jazz choices and no cover charge! We’ll all have to move in on a permanent basis perhaps two weeks at the Proximity and two at the O.Henry to do it all! ← Conquering the Mountain at Killington.